This multi-purpose rig is a poncho or it's a bivy-shelter or a tarp to provide shelter from squalls. You can cinch it closed when it's on your body or peg it out when used as a tarp. It's compressible, so it packs up small when not needed. Bring it hiking or skiing, to music festivals, or when you're volunteering at a windy marathon aid station. Made of 2.5-layer Ventia fabric with a 70-denier nylon face and a waterproof-breathable polyurethane laminate. Fully seam taped for waterproof and windproof protection. 2-way water-resistant zippers with stormflaps on front and armholes. 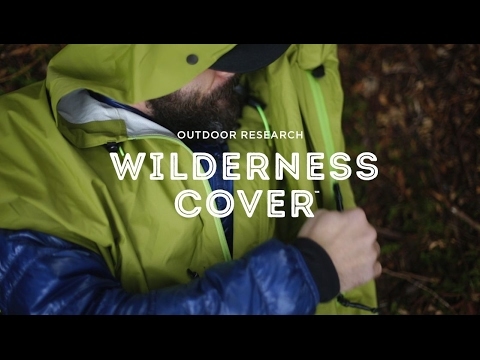 Wire-brimmed hood snaps to chest for protection while in bivy mode. Bottom drawcord can be tightened around the waist for walk mode or closed over the feet for bivy mode. 8 tie down loops for use in tarp mode. Internal mesh pocket for small essentials. Fully opened dimensions are 1.82 x 1.64 m.